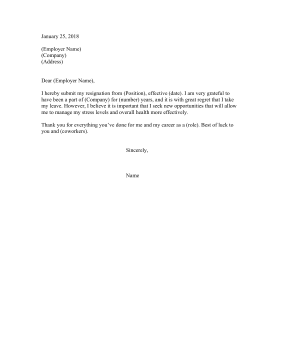 Cite stress as your reason for leaving a job with this sample resignation letter. I hereby submit my resignation from (Position), effective (date). I am very grateful to have been a part of (Company) for (number) years, and it is with great regret that I take my leave. However, I believe it is important that I seek new opportunities that will allow me to manage my stress levels and overall health more effectively. Thank you for everything you've done for me and my career as a (role). Best of luck to you and (coworkers).